You need this product. Concert guitarist, Rico Stover, the author of Six Silver Moonbeams- The Life and Times of Agustin Barrios Mangoré, told me about and gave me a bottle of this nail hardener. The price is $29.95 for a 1/2 oz. bottle, and in just a few days you will stop breaking nails, you won’t even get nicks in the tips. The bottle will last for 3 years. One brushfull will do a complete set of nails. 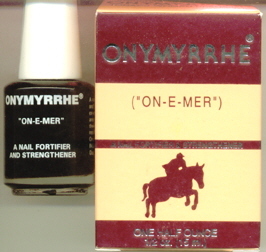 Onymyrrhe is the name, it fortifies and strengthens your nails, just put it in the online order form, come in or call me. This will change your musical experience.The frustration of broken nails is over. This is 100% all natural Onymyrrhe. Presented in this informative text is a concise, clear picture of the fingernail, its anatomy, what affects its health, how to combat weak nail problems, how to obtain strong, healthy nails and what products to buy. Included is an analysis of all currently available artificial nail systems (acrylics, wraps, gels and glue on tips) with a discussion of the potential health risks involved. The Guitarist’s Guide to Fingernails also introduces a revolutionary new artificial nail system that is nontoxic, removable yet effective, with no risks to the health of your natural fingernail. An absolute must for guitarist’s of all kinds! Used and endorsed by Argentine guitar virtuoso Jorge Morel, Sharon Isbin, Benjamin Verdery, etc.